Learning how to make candy corsages is a fun and creative process. Once you master the basic ideas behind these unique creations, you can branch out to incorporate a variety of themes, styles, and different materials to make edible corsages for any occasion. Candy corsages are perfect for young girls, but don't feel limited by age or even gender with your designs. Candy corsages are an interesting twist on the usual floral corsages. They became popular in the 1950s as an alternative to flowers, and were mostly used to celebrate young girls' birthdays at the time. These corsages featured a single type of candy accented with ribbon and tulle. Today, candy corsages can be worn for any occasion and can be made from any combination of confections and added materials. You can incorporate candy into a basic corsage made of flowers, or skip the flora all together and design a corsage made completely from candies. These lovely accents can be made to wear on the wrist or pinned on to clothing. Candy is heavier than flowers and greenery, so make sure that your candy corsages aren't too big and bulky. While regular corsages are normally coordinated and tasteful, their candy counterparts can either be stately or outrageous, or somewhere in between. Candies have a tendency to melt or become misshapen in the heat. If the finished corsage is to be worn outdoors in warm weather, use hard candies that won't turn to mush. Here's how to make candy corsages, using the traditional idea of a single type of candy along with ribbon and other adornments. Using the glue gun, attach loops or "tear-drops" of ribbon around the perimeter of the plastic base. The loops should extend past the edges of the plastic, giving a daisy-like appearance. Depending on the size of the plastic base, you can add a second layer of ribbon loops inside the first ring, slightly smaller than the first. Glue fabric, contrasting ribbon, or artificial flower petals to the base, filling in any empty spaces and completely covering the plastic. Glue several candies or lollipops into the center of the corsage. 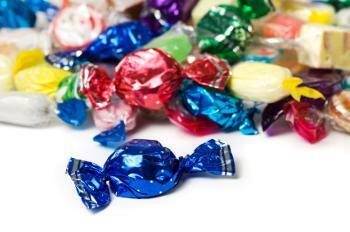 Candies can be wrapped or unwrapped, depending on your preference. Create a ring with the sewing elastic that will fit snugly around the recipient's wrist. Sew the ends together using a needle and thread. To make a pin-on corsage, cover the plastic base with several layers of green florist's tape before adding ribbons and candy. When you're finished adding all of the decorative materials, use pins to secure the corsage through the florist's tape. Use seasonal or holiday candy to make themed corsages, such as candy canes for a Christmas theme, or candy corn for Halloween parties. If you have old tack pins on hand, you can glue a couple of them to the back of the plastic base to create a safer pin-on option. For a corsage made completely of candy, use string licorice instead of ribbon, and choose lightweight, contrasting candies to provide visual appeal. Change the shape of the plastic base to make different corsages. Youngsters will certainly enjoy their candy corsages for birthday parties, graduations, or other special occasions, and they also make fun gifts for teachers, family, and friends. They can be a unique addition to a craft table at craft fairs and sales, too!